With the ever-increasing demand for hair extensions and hair replacement systems, hair extension technologies have had to adapt to cater for this need in modern times. The quality and availability of hair extensions has advanced considerably over the last few years to offer much more achievably fabulous hair. Human hair extensions are necessary for the women who do not have long hair. Join the countless women who have uncovered their hair using hair extensions. Short or thin hair does not have to be a problem anymore, and attaining both volume and length is now incredibly easy. You can even resolve hair issues with a proper consultation and salon appointments with professional and well-trained hair experts that specialize in extensions. When you think of the term hair extensions many think of it as lots of long hair which is not always the case! Hair extensions can be used to create flashes of color, add volume to a short hair styles, or can even be used to survival trick to a bad haircut. Anything is possible with hair extensions. One of the best catches in wearing a hair extension is you can now wear them not just in one or two but in different ways such as clip-in, tape-in, keratin bond, sew-in, micro rings/loops on to other hair by incorporating additional human or synthetic hair. Natural human hair can be permed, dyed, and flat ironed whereas synthetic hair cannot. These methods include tape in extensions, weaving method, fusion method, clip in or clip on extension, and wigs. At StyleU Salon, we pride ourselves on the quality and craftsmanship of our hair extension. Hair Extensions have never been more popular, so we target our hair extensions to the most discerning hair extensions admirer. As its name suggests, you simply have to clip the hair extensions in to secure them properly, and you’re good to go. The clips should run along the horizontal section of your head where you want to clip them in. The purpose of Clip in Hair extensions is to add length, volume and thickness instantly. Our clip in hair extensions will transform your look in seconds. With proper care and regular wear, clip-ins last anywhere from 3 – 6 months, up to a year and sometimes even longer. Tape-In Hair extensions are exactly what they sound like. The extensions are pre-taped and then taped or glued together on either side of your own hair. Tape-ins are considered semi-permanent. They last 4 – 8 weeks before you need to remove and re-apply them. If you’re planning to wear hair extensions for a much longer period and consistently, you might as well go for the keratin bond. This involves installing micro hair strands with keratin near the roots using a heated tool. Not only does it ensure firm attachment of your extensions, but it also blends and appears more natural together with the human hair. Weave hair is applied by braiding the natural hair into cornrows first, then using a needle and thread to sew the weave into the braid or cornrow. The tight application method often puts a strain on the scalp and can feel very heavy or uncomfortable, which is also why it doesn’t work well with thin or lighter hair. It is recommended to remove the weave every 6 – 8 weeks. Micro Loop Hair Extensions offer a user-friendly way to attach human hair extensions. Using the plastic loop; the client’s hair pulled through a pre-attached copper ring. This ring is then clamped tight to attach to the customer’s hair. As this method involves no heat or chemicals. It makes it very easy to choose to those looking to wear hair extensions for an extended period. 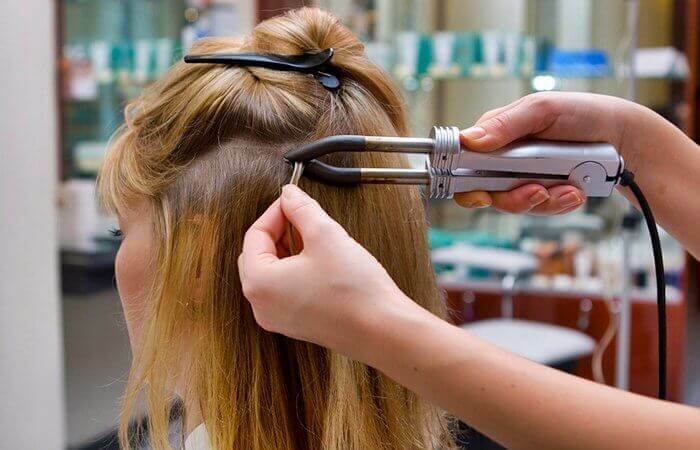 Micro Ring Hair extensions also offer a convenient way to apply for hair extensions without the use of heat or glue. A metal pulling loop is used to thread the client’s hair with small Micro Rings. Once the rings is on the client’s hair, the strand of hair is inserted into the ring and clamped flat; the type of hair used for this technique is called Stick Tip/ I-Tip extensions. These hair extensions are considered semi-permanent and they generally last up to 4 months. The Fusion method is great for clients with very fine hair because it enables you to apply tiny invisible micro bonds and the hair comes in a great range of fabulous colors which also includes some fantastic vibrant shades for those who want to be more daring. They are considered semi-permanent as they stay in your hair for up to 4 months. Whichever way you choose, longevity depends on whether they are synthetic or real and once again the way you take care of them greatly affects their lifespan as well. Normally, real human full wigs can last for up to one year if you take good care of them. The smaller pieces are usually synthetic and typically don’t last more than one month of use. Whatever method of hair extension attachment you choose, always remember this: maintaining them comes with a non-negotiable deal of commitment. The first reason why you must spend the time necessary to take good care of your hair extensions is that they are usually an important component of your appearance and how you’ll be perceived by people who you come across. Extensions that are well taken care of will look healthy, lustrous and attractive, while those that are handled shabbily will likely do more harm than good to your fashion cred. in taking care of your hair extensions, it’s better to get professional help as much as possible, and generally make sure to handle them gently, so you can prolong their lifetime and keep them lustrous for as long as possible. What are the benefits of having Hair Extensions? The thing we love about our job is seeing the way Hair Extensions can transform the way people feel about themselves. It is amazing what results you can achieve by adding volume, length or color. Hair Extensions are a great way to create that instant new look in very easy way. They are a great way to change your look and boost your confidence in an instant. Great way to add hi-light effects without having to bleach your natural hair. If you struggle to grow your natural hair. Best solution to deal with a bad haircut. When hair is really fine and needs that extra volume. Why opt for Hair Extensions? Hair extensions add length, quick styling, and damage free experience. The greatest benefit of hair extensions is, they are reusable. The money invested into luxury hair extensions and clip-ins is not wasted. They eradicate the need for many styling appointments, saving you money at the hair salon. With proper care, a luxury hair piece can last a long time. A consultation should always be carried out before having hair extensions fitted, this will ensure your hair is suitable for extensions, check the color match, help to decide on the look you wish to achieve, and answer any questions regarding aftercare. We have an entire team dedicated to your hair extension needs, if you require any further assistance or would like a color match, please don’t hesitate to get in touch with StyleU Salon.